This beautiful vintage wedding dress is approx 60 years old. 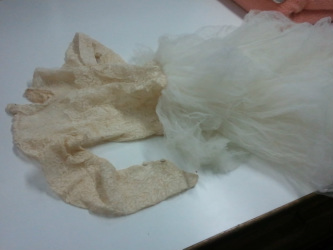 When it was brought in it was very yellowed and the tulle actually 'crunched' when touched. Our expert wedding dress restorer was confident that we could have it back to almost new condition with a little of our specialist TLC. What a difference! The owner was ecstatic with the result. The dress is again as beautiful as when the lady made it herself during the 1950's. Bring in your gown and let us work our magic! Wedding dresses lovingly wrapped and boxed in acid free tissue from $400 or perhaps you would like to have your dress as art on your wall? Ask us how.